If you attend the USATF Olympic Trials, they hold a fantastic SuperClinic series on the “rest day break” every year since 1992. The 2012 SuperClinic will be on Tuesday 26 June at the Boulevard Grill on the south end of Franklin, 5 blocks from Hayward Field. The 2008 SuperClinic featured Dwayne Miller, where he presented LaShawn Merritt’s Training program. You can download the PDF of his Annual Plan labeled “from Prep to Pro” directly from the USATF website here (PDF). At the first glance, you’ll notice his training philosophy is definitely a long to short approach, with an emphasis on aerobic capacity similar to Clyde Hart, and to some degree, Bud Winter. You can even argue the rain delay and wet track of the 2009 Berlin World Championships prevented LaShawn from running faster. 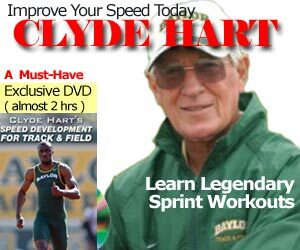 Like Hart, Miller’s approach to speed work is similar to Clyde Hart where he finds “too much too early” will injure an athlete. For a free audio podcast of Dwayne Miller, visit the Canadian Athletics Coaching Centre and go to their multimedia section, or you can use the player below. You better have a good support staff of physios and massage therapists. Even sport psychologists! I personally find a 1 hour long run in the fall excessive for a 400 meter runner, but if it works for him, great. Even Bud Winter had his sprinters build up to a 10 mile run in September. Lee Evans ran cross country, but that’s another story. There is a lot of over distance work going late into the season. If you read Training for the 400 meters: A Retrospect, you’ll understand why the 400 meters is a fine balance between speed and speed endurance. You are constantly working both ends of the scale. Listen to the Podcast for an insightful look at another great coach. @Cov-god – oops, sorry, forgot to mention the Amazon store is for US only. I’ll see what I can do. Brilliant, ordered. Thanks Jimson . how can one really take anything to do with merritt seriously , he has served a doping ban so any real methodology of training is tainted !! When he was 19 years old (in 2005) he was running 20.38 & 44.66 for the 200/400. That impresses me. Agreed, there is a ‘taint’ but you still have to understand any PED will not make you super without hard work! And hard work of the right kind. 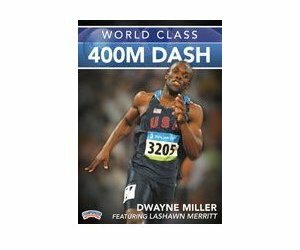 As Jimson pointed to, when Merritt was with miller earlier in his career he was mightily impressive and of course as showing with millers other athletes. with the utmost respect ! i do understand , i also understand that at 19 there is huge capacity for hard training that whose performances will be enhanced by peds regardless of what he did, his times may still be down to having a little help! nb marion jones who was doping since her early college years , there really is no way of knowing how much percentage wise was hard work natural talent and hard work ,natural +peds. also this guy should have an olympic ban , it asks once again about american training attitudes !!!!!! !and the usatf , look at several of michael johnsons american compatriots of the 1990s over 400 who later got done! its not that it wasnt impressive but hey lads , time has shown anything merritt has done has ! to be taken with caution before believing that his coaches methods are that! effective. note , lifetime ban at international competition for all caught doping . includes the likes of chambers on this side of the pond . note whose asking about the training methods used by legits of the likes of andrew rock! , or maybe his 200hundred wasnt fast enough ??? and why a talent like his wasnt helped along by the usatf , or indeed the training methodsof that of bershawn jackson ? and to interpret some analylists , its ok to use peds if you work hard because that way! fast times are achievable! and yes the last comment is there to chastise!! wink.. wink.. respect!! yes, I am building one as we speak. The Forum will consolidate 4 sites: SpeedEndurance, StrengthPowerSpeed, BudWinter, and RunningMechanics. dear jimson and cov-god, excellent stuff guys !, have to say i am enjoying all this information and for all the right reasons, and of course looking forward to forums.and jimson but i reckon i will prefer annoying you on speedendurance!!! Haha, at first i thought this was a recent interview (stupid me). then while listening to audio, i heard the anti-drug stff and figured either Dwayne Miller is tripin’ hard or this talk is old. Came back and saw the broadcast date and it all makes sense now.